Are you a landlord with frustrating tenants? You’re not alone. Many landlords find out the hard way that they have frustrating tenants in one of their rental properties. 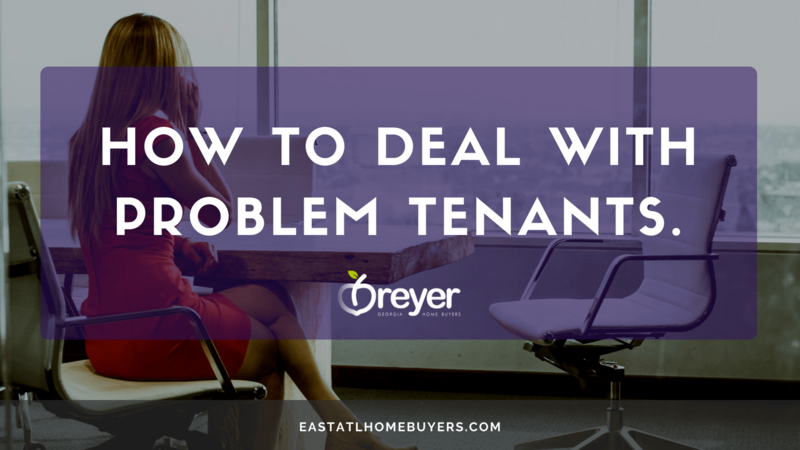 In this article, we’re sharing 4 ways to deal with a frustrating tenant in Atlanta, Georgia. If you own a rental property, sooner or later you’re going to deal with a problem tenant in one of your properties. Maybe they trashed the property, maybe they never pay rent on time, maybe there are too many people living there, maybe they just call you for every little thing. No matter what the situation, tenants like that will eventually rent your property. Here are 4 ways to deal with a frustrating tenant in Atlanta when it happens it to you. The theory behind Cash for Keys is simple: Giving the trouble tenant money to leave is cheaper than paying an Atlanta eviction attorney for an eviction. Think about it: Evicting a tenant in Atlanta will likely take a month or longer, depending on your state. It could cost you several thousand dollars in legal fees to do so, on top of the lost rent for at least a month, maybe two, three or more. Then, you have to deal with the clean-up of a tenant who was just evicted, which is never very pretty. All in all, a normal eviction could cost you around $5,000 or more. But what if you could just offer your tenant $500 to leave the property in good condition? Exactly. That’s Cash for Keys. Eviction seems harsh, but it’s the business of rental properties. If a tenant can’t pay, or they are trashing your property, you have to remove them from your property. Sometimes, it’s as simple as asking them to leave. Other times, you will have to go through the formal eviction process. There are a number of reasons why you may need to evict a tenant. The most common one is the nonpayment of rent, but other reasons include violating the terms of the lease or rental agreement (for example, having a pet when the agreement has a no-pets clause or making excessive noise that disturbs neighbors and other tenants), causing serious damage to the rental premises and carrying on illegal activities, like dealing drugs. In some cases, even though your tenant hasn’t done anything wrong, you may still need to end their tenancy (for example, you may need to occupy the rental unit for your own personal use). If your tenants are a real hassle and causing you a lot of stress and expense, then you can always sell your property. In fact, a lot of rental property owners that sell to us do so because of the frustrations they face dealing with tenants. Depending on who you sell to, you may not even need to evict your tenant first (for example, in many cases, we just buy and evict for you). For rental property owners with family living in the rental, this is an ideal solution and a one of the great ways to deal with a frustrating tenant. If you want to sell your rental property to us and finally get rid of the hassles and headaches, then get in touch and let us know about the property so we can make you an offer. Click here now to fill out the form or call our team at (770) 744-0724.